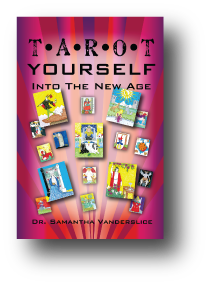 Dr. Samantha Vanderslice has been studying, teaching, and reading Tarot since 1967. She has traveled extensively, sharing her knowledge through classes, workshops, and individual sessions. In 1973 her journey brought her to Austin, Texas, where she is director for the SOL Center of Love and Light. Over forty years has gone into the writing of this book, Tarot Yourself Into the New Age. The book, along with its accompanying deck of original, hand-drawn tarot cards, is designed to share with you the wisdom encoded in this ancient system of self-knowledge. Life Rewound weaves a mystical story of pain, love, loss, forgiveness, redemption, and Higher Consciousness. Where is your light in a world of darkness? 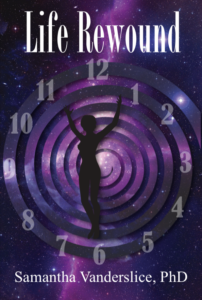 After a lifetime of struggle led Amanda to her darkest moment, her Guardian Angel appears and offers Amanda the chance to go back in time, heal her traumatic childhood, and reinvent her life. Dr. Samantha Vanderslice was introduced to mysticism at the age of twelve, setting in motion a lifetime pursuit of metaphysical knowledge. A gypsy at heart, her travels throughout the Americas and Europe eventually brought her to Austin, Texas. Samantha earned her Doctorate in Metaphysical Sciences and Reverend ordination from the Church of Metaphysical Sciences. She authored the book; Tarot Yourself into the New Age. Available at OutThereBooks.com or Amazon.